As ancient Egypt was building its pyramids, termites in Brazil were busy building their own sprawling monument. 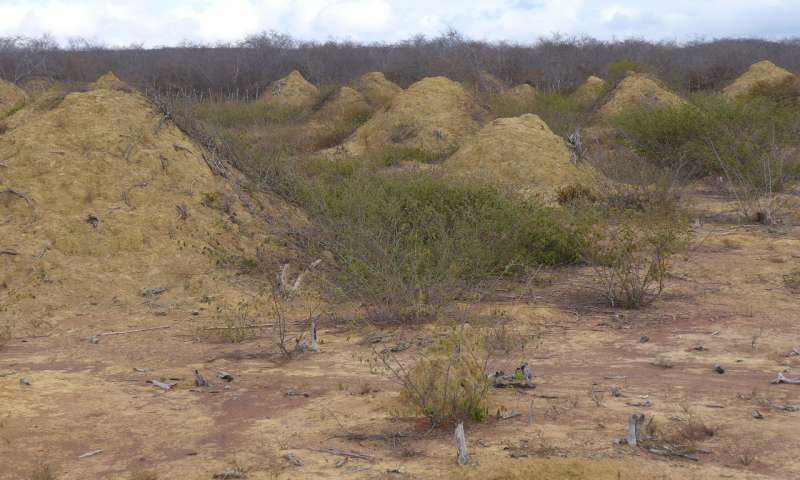 A new study reports that a sprawling complex of still-inhabited termite mounds in northeastern Brazil is up to about four millennia old. The structure is immense, covering nearly the same size as Great Britain (230.000 sq km), making it the largest known insect-made structure on the planet. “These mounds were formed by a single termite species that excavated a massive network of tunnels to allow them to access dead leaves to eat safely and directly from the forest floor,” says first author Stephen Martin of the University of Salford, UK. The mound complex is so large that it’s easily distinguishable on Google Earth. However, they’re not where the termites (Syntermes dirus) live, per se. They’re actually a byproduct of the insects’ slow and steady excavation of a network of underground tunnels. All that digging (over thousands of years) has resulted in a lot of extra soil, which the termites deposited in 200 million cone-shaped mounds. Each mound is roughly 2.5 meters tall and 9 meters across (8 and 30 feet, respectively). The mounds were erected in the dense, low, and dry type of forest specific to northeastern Brazil — the caatinga. They’re usually inconspicuous, hidden from view by the trees and thorny shrubs of the area. However, when some of the lands were cleared to make way for pastures in recent years, the mounds stood out like so many sore thumbs. For the study, the team collected core samples from 11 mounds and dated the material therein. This step revealed that the structures were filled in between 690 and 3,820 years ago, making them about as old as the oldest-known termite mounds (in Africa)..
Next, the team analyzed whether the regular spatial pattern of the mounds was driven by competition among termites in neighboring mounds — in other words, if the overall layout was ordered because termites tried to be equally-far away from all their aggressive neighbors. However, this didn’t pan out: field tests revealed there was little aggression and conflict to be found at mound level. This stood out in stark contrast to the behavior of termites collected in other sites from mounds spaced further apart, which are quite ill-tempered against one another. Based on this result, the team proposes that the mound pattern arose through the termites’ self-organization and was driven by episodic leaf-fall in the dry forest (which the insects feed on). The tunnels are used to secure access to a sporadic food supply, they add. Finally, they suspect that a pheromone map might help the termites orient themselves from the colony to the nearest such waste mound. “It’s incredible that, in this day and age, you can find an ‘unknown’ biological wonder of this sheer size and age still existing, with the occupants still present,” Martin says. There are still many things we simply don’t understand about the site — for example, no one knows how these termite colonies are structured because a queen chamber of the species has never been found. Hopefully, Martin and his team will return to the colony to answer all these questions. The paper “A vast 4000-year-old spatial pattern of termite mounds” has been published in the journal Current Biology.